Be the first to share your favorite memory, photo or story of Kemma. This memorial page is dedicated for family, friends and future generations to celebrate the life of their loved one. 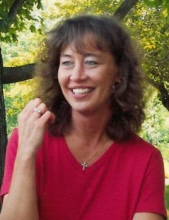 Kemma Rae Froman, age 55 of Olivet, IL passed away peacefully in her home on Tuesday, April 2, 2019. Kemma was born October 29, 1963 in Danville, IL to Thomas Michael and Joyce Marie (Gardner) Froman. Kemma was a lifelong area resident, and a member of Vermilion Grove Friends Church. She loved the outdoors, gardening, antiquing, and had a cat named Spot. More than anything, she loved her family and friends, and treasured spending time with them. Kemma was preceded in death by her parents. She is survived by one brother: Michael (Kathee) Froman of Ashville, AL; two sisters: Lynda (Bruce) Gritten of Dana, IN and Tamara Weiss of Olivet, IL; two nieces: Kelley Johnson and Karla Acord, and two nephews: Jason and Ben Weiss. Funeral services will be held Saturday, April 6, 2019 at 3:00 p.m at Vermilion Grove Friends Church. Visitation will be held for two hours prior to the service, beginning at 1:00 p.m. Burial will follow at Crown Hill Cemetery in Ridge Farm, IL. For those who wish, memorials may be made to Vermilion Grove Friends Church or to Crown Hill Cemetery. To send flowers or a remembrance gift to the family of Kemma Rae Froman, please visit our Tribute Store. "Email Address" would like to share the life celebration of Kemma Rae Froman. Click on the "link" to go to share a favorite memory or leave a condolence message for the family.